Bake me a cake as fast as you can." We've all grown up with this nursery rhyme and we can all remember clapping along as we put a cake in the oven "for baby and me". 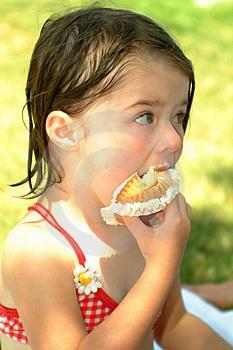 Patty-cakes or cupcakes are child's play - easy and quick to make and they look fantastic. Every time we celebrate a special event in our lives we seem to have a cake for the occasion. ...and giving a gift of home-made cupcakes to a loved one shows that you care. Place individual cakes in Chinese noodle-boxes for guests to take home as a keep-sake of your special occasion. Box up six and they become a beautiful present that really shows that you care. A plate of similarly frosted cupcakes is perfect for any occasion. 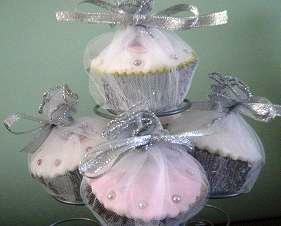 A tiered stand of cupcakes becomes a centrepiece and a talking point suitable for any wedding, engagement, or high tea. You can be as creative as you want when it comes to decorating. You can mix and match any of the cupcake recipes and frosting recipes included in this website to achieve the flavour combination you are after. Flavour is important but the "look" is the first impression your friends and family will get. Be inspired by colours and textures. Don't be afraid to make wedding cupcakes yourself. There are so many specialty products available for decorating cupcakes that sourcing these is not difficult. Bake and frost your cupcakes and use a pre-made topper to complete your design. Our cupcake designs are only limited by our imaginations. It sounds daunting to tackle Wedding or Anniversary cupcakes on your own, but with careful planning it is easy to achieve. It is also a huge accomplishment to be able to say "I made them myself". I will show you how to make and decorate cupcakes with easy step-by-step instructions. All recipes and decorating ideas are tried and tested by me - a mother of three children with plenty of experience, but not much time, to cook. Our love of cupcakes has started a world of cupcake-inspired products. As well as cooking, I will also show you how to make soap and candles using cupcake-shaped moulds. Moulds can also be used to make plaster shapes that can be painted and decorated to look like the real thing. They will look so life-like you'll have to make sure your guests don't take a large bite! I also have a birthday party page. You'll have to check out my cupcake pinata and other party game ideas. My site will show you that you don't have to be a professional to create fantastic cupcakes. I haven't forgotten man's best friend. There are pages devoted to "Pupcakes" - cupcakes for your dog. These are also easy to make and great for your pet's birthday or any other special occasion. I hope to give you the motivation to bake or create and decorate your own cupcakes. I would love you to help make my website even bigger and better by sending in photos, recipes or tips of your cupcake sensations. We can then share our ideas and help everyone to make cupcake masterpieces. Discover how to make cupcakes that will earn you the title of Cupcake Genius amongst your friends and family.